Ann Arbor planning commission meeting (Sept. 17, 2013): A major new apartment project in northeast Ann Arbor was discussed but ultimately postponed by planning commissioners, pending unresolved issues that the planning staff did not have sufficient time to review. Traverwood Apartments is a proposed complex of 16 two-story buildings and 216 one- and two-bedroom units on nearly 22 acres off of Traverwood Drive, north of Plymouth Road. It’s one of the first large residential developments in the last few years that’s come forward outside of downtown Ann Arbor. For part of the site, a rezoning would be required – from ORL (office, research and light industrial) to R4D (multi-family residential). Developer First Martin Corp. is making the proposal. 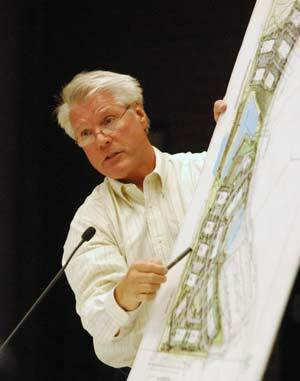 In response to a query from commissioner Bonnie Bona, Mike Martin explained that although the site would allow for denser development – taller buildings and more units – the cost of construction would have been high, and they didn’t think they’d be able to charge the amount of rent necessary to make a larger project feasible. The site is east of the city’s Leslie Park golf course, and south of Stapp Nature Area – created on land that First Martin sold to the city in 2003. Some of the discussion on Sept. 17 centered on pedestrian connections between those parks and the apartment complex, which will include a path running along the west side of the site, next to Leslie Park. 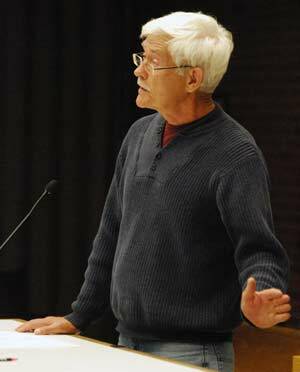 During a public hearing on the project, resident Paul Bruss supported the concept of that kind of public trail. He described a vision he shares with others, of a trail that would start at Stapp and loop south then west around the Leslie Park golf course, going north all the way to the Dhu Varren Woods Nature Area. “If we could figure out a way to connect all that as a necklace around Leslie golf course, this would be one of the premium trails in Ann Arbor,” Bruss said. Commissioners Bona and Ken Clein advocated for more of a pedestrian focus within the complex. Calling First Martin and the architect firm Hobbes + Black “kind of the dream team for developing in Ann Arbor,” Clein – a principal with Quinn Evans Architects – expressed disappointment at the “cookie cutter” site design. Depending the outcome of a staff review, the apartment project might be on the planning commission’s agenda for consideration as early as Oct. 1. 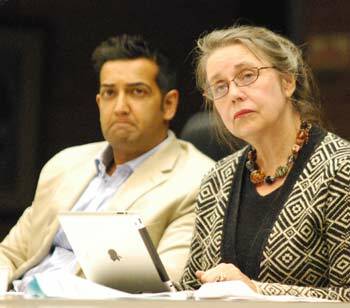 The other action item on Sept. 17 was authorizing two planning commissioners – Paras Parekh and Sabra Briere, who also serves on city council – to attend the Michigan Association of Planning annual conference, held this year from Oct. 2-4 in Kalamazoo. Their expenses will be paid for out of the city’s training budget for planning staff and related commissions. Also during the meeting, planning manager Wendy Rampson gave a brief update on the work of consultants who are developing recommendations as part of a downtown zoning review. The consultants – Erin Perdu and Megan Masson-Minock – plan to present their report at the planning commission’s Oct. 8 working session, with commissioners considering the recommendations at their Oct. 15 regular meeting. The project – being developed by Ann Arbor-based First Martin Corp. – requires site plan approval and rezoning, as well as approval of a wetland use permit. 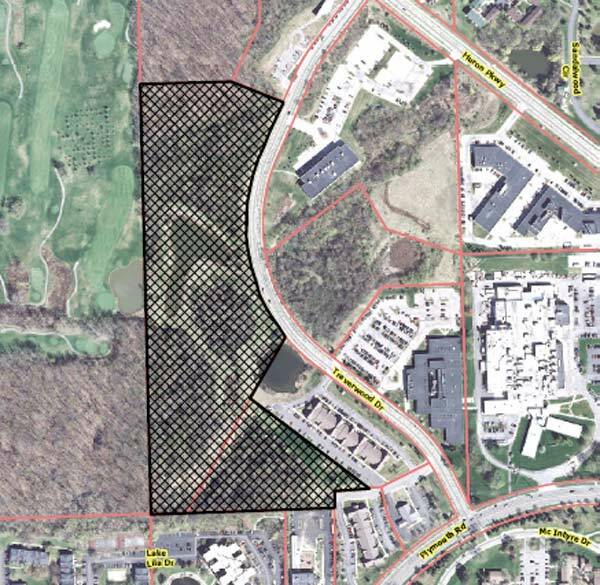 The site is east of the city-owned Leslie Park golf course and south of the city’s Stapp Nature Area and the Traverwood branch of the Ann Arbor District Library. Aerial view of proposed Traverwood Apartments site at 2225 Traverwood Drive, north of Plymouth Road. The total 21.8-acre site, which is currently vacant, is made up of two parcels: a 17.96-acre lot that’s zoned R4D (multi-family residential), and an adjacent 3.88-acre lot to the south that’s currently zoned ORL (office, research and light industrial). The smaller lot would need to be rezoned R4D. The property is located in Ward 1. The project likely will be constructed in phases, with the first phase consisting of 11 buildings on the southern portion of the site, and the community center. The complex will include 336 parking spaces – 152 spaces inside garages and 184 surface parking spaces. According to a staff memo, the property has several significant natural features, including 196 landmark trees. The higher-quality native woodland, located on the northern portion of the site, will not be disturbed, but about 40 landmark trees will be removed for construction in other parts of the property. An additional 165 trees will be planted on the site to mitigate the trees that will be removed. The owner will also put in a woodchip path connecting to the adjacent Stapp Nature Area to the north. That nature area was created when First Martin sold eight acres to the city in 2003. 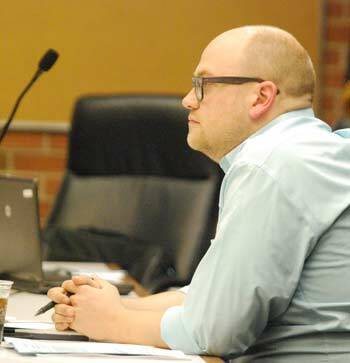 Matt Kowalski, in giving the planning staff report, said there will be an extensive sidewalk system looping through the interior of the site, with connections to Traverwood Drive and to the nature area. There will be two new curbcuts onto Traverwood. The apartment complex’s drive will also be connected to an existing drive off of Traverwood that currently serves the office complex to the south and east. There are three main wetlands on the site, including a natural pond with a wetland fringe, and a large regional detention pond built in the late 1990s as part of a broad stormwater management effort. One smaller wetland area will be removed. The owner must secure a wetland use permit from the city and a permit for wetland disturbance from the Michigan Dept. of Environmental Quality. The project also requires approval from the Washtenaw County water resources commissioner. The city’s parks staff is requesting a formal easement for a public path on the property, which will be included in the development agreement. The city’s planning staff had recommended postponing action on the Traverwood Apartments proposal. Outstanding issues relate to utilities, natural features, connections from the site to adjacent properties, and wetland mitigation. Kowalski reported that the owner had submitted revised plans on Sept. 16, but the planning staff didn’t have sufficient time to review those plans before the Sept. 17 meeting. Mike Martin of First Martin Corp. spoke briefly, introducing himself as well as Earl Ophoff of Midwestern Consulting and architect James Sharba of Hobbes + Black. He said they were there to answer any questions. Paul Bruss, a nearby resident of the proposed Traverwood Apartments. Paul Bruss also spoke, telling commissioners that he’s a runner who frequently runs through the property down to Leslie Park. “I’ve got buddies who do the same,” he said, and they wanted to ensure that the public path would run next to Leslie Park, and not through the apartment complex. They’d prefer to keep the running trail as natural as possible, Bruss said. Some people have a fantasy, he added, that one of the amenities on the city’s northeast side could be a connector trail that allows you to go from Stapp Nature Area along the western side of the proposed Traverwood Apartments, and through Leslie Park. It would involve a bridge over the railroad, he noted, allowing you to go from the southern edge of Leslie Park golf course and into Black Pond Woods Nature Area. From there, you could go north through the Traver Creek Nature Area and Dhu Varren Woods Nature Area. There are wonderful ridges in Dhu Varren Woods, Black Pond Woods, Leslie Park Woods Nature Area – south of the golf course – and even in Stapp, he said. Bruss indicated an intent to talk to the Ann Arbor park commission about this idea, too. Bonnie Bona noted that the staff report indicated that the project had been revised several times, in response to issues raised by citizens and staff. She asked how the plan had evolved. Earl Ophoff of Midwestern Consulting reported that there had been seven alternative site plans, which are included in the staff report because they were presented at the mandated citizens participation meeting. Originally the development team was looking at larger buildings – on the order of seven to nine stories high, he said. Residents had given a lot of feedback about the trails as well as the native forest on the north end of the site, he reported. That feedback led the developer to rethink the location of the buildings, as well as the intensity of use. The result is that the project is proposing smaller buildings – only two stories – and smaller units of one and two bedrooms, Ophoff said. The total number of units also declined, from about 260 apartments in the previous iteration, to 216 units in the proposed version. Bona noted that it’s unusual to see a developer propose a project with significantly fewer units than the city would allow. She wondered why that was the case. Mike Martin fielded that query. He said it became obvious that in this particular setting, given the site’s topography, it wasn’t economically feasible to put larger buildings on the property. Originally, he said, they thought there was a market that wasn’t being served in that area, and that larger buildings might appeal to a particular demographic. But they ultimately decided that while tall buildings might work downtown, it was more challenging in that northeast Ann Arbor location. “Frankly, [taller buildings] were very, very expensive,” Martin said, and people in that part of town don’t expect to pay rents that they might pay in a more urban location. So it was a combination of the cost of construction, he said, as well as an assessment that they wouldn’t be able to charge the amount of rent necessary to make the project feasible. Sabra Briere recalled that that at the citizens participation meeting, the developer had indicated there were two types of people who might be attracted to the new apartments: young families, and empty nesters. She wondered how the developer would define the demographic for the current version of the project. Martin replied that prospective renters would be typical for the demographic on the north side of town. The apartments aren’t designed for student housing, he said. Other large apartment complexes in that area – like Windemere or Ironwood – get a mix of graduate students and families. He expects the Traverwood Apartments would get a good cross section, including people who work at the nearby University of Michigan North Campus Research Complex (NCRC) and the EPA lab, both located on Plymouth Road. “We’ve tried to set up units to be as attractive to as large a cross section as we can,” Martin said. Kirk Westphal asked about the materials of the buildings. James Sharba of Hobbes + Black replied that the buildings will be brick, cast stone, and almond-colored HardiePanel siding. The roof will be shingled, with standing seam metal. Westphal also asked for clarification about the project’s phased development. Ophoff said the intent is to start development in the south, where the existing sanitary sewer main is located. If the timing, financing and marketing is such that it makes sense to pause after building the first phase, then that’s what they’ll do, he said. Ken Clein wondered how much of the site is being paved. Matt Kowalski replied that he didn’t have that information at hand, but it could be provided. Kowalski also indicated that a photometric plan has been submitted, and is acceptable. Earl Ophoff of Midwestern Consulting. Clein also asked for clarification about where the public path would be located. Ophoff described the location, running along the property’s west side next to Leslie Park golf course. The final layout will be designed in coordination with the city’s parks staff, he noted, in order to ensure connections with adjacent park paths. Westphal asked about public access for this path. Kowalski replied that details are still being worked out with the parks staff, but it will likely entail a permanent easement of some kind, which will include requirements for maintaining the path. The site plan for this project looks different, she said. Her interest in asking about this related to the dominance of vehicles compared to the comfort of pedestrians and bicyclists. She asked for more information about how the drives will be constructed. Bona also wanted more information about the sidewalks that are internal to the complex. It’s clear where the path is on the west side of the site, she said, but what about people who were entering the site from the east, perhaps walking in from the nearby office complexes? Ophoff described how the main drive will loop through the complex. As much as they could, the developer’s team wanted to create a “street experience,” he said. For pedestrians, there will be a 10-foot-wide path along Traverwood Drive, with connections to sidewalks along the sides of the complex’s internal drive. The sidewalks also will be connected to the trails on the west and north sides of the property. Responding to another query from Bona, Ophoff indicated that the locations of crossings for pedestrians will be clearly marked. Bona asked that when the project returns to the planning commission for consideration, it would be helpful to have a site plan showing the sidewalks in color, so that the location would be easier for commissioners to see. Sabra Briere wanted to know whether the city or the developer would be responsible for plowing snow on the drives, and whether the drives will be wide enough for snowplows. Ophoff replied that these will be private drives that will be maintained by First Martin, not the city. Snow storage areas are indicated on the landscaping plans. Planning commissioner Ken Clein, a principal with Quinn Evans Architects. Clein echoed Bona’s request for a more clear depiction of the pedestrian walkways. He said he recognized the challenges of developing a large site like this, with significant natural features and unusual shapes, and he understood the goal of making good economic use of the site. However, he said, it’s disappointing that this project is designed around the roadway, with the buildings filled in around it. In that regard, it’s like most other projects of this type, he noted, and it results in a lot of pavement. Clein added that he understands the argument for it – that people will be driving in and out of the site. But there have been successful developments that have a lot less pavement and a lot more pedestrian-friendly design. Paras Parekh noted that the development has more bicycle spaces than the number required by city code. He asked about where those would be located. Ophoff noted that because there are so many garages and each garage includes a bicycle space, that alone exceeds the city’s requirements. Additional spaces are provided outside the apartment buildings and at the community building. Paras Parekh asked how the developers will mitigate the small wetland that will be removed. Kowalski explained that right now, the wetland area – a former sedimentation basin for stormwater management, which has evolved into a wetland – is choked with vegetation. The developer recently submitted plans that detail how the removal will be mitigated, Kowalski said, but the city staff haven’t had time to review that proposal. That’s one of the main reasons why staff have requested postponement. Jeremy Peters asked for a description of the part of the property that was previously used for farming. Kowalski referred commissioners to the aerial view of the site that was part of their meeting packet. Most of the site south of the native woodland area was used for farming, he said. Peters expressed concern about soil quality, given that farming had occurred prior to the 1960s when there was less stringent regulation of chemicals that could be used. He wondered if any soil testing had been done. Ophoff confirmed with Peters that the concern was about whether there had been an intensive use of pesticides, or whether there had been orchards that had been sprayed. Ophoff noted that no farming has taken place there for decades. Even by the 1940s, not much farming was taking place there, based on historic photos, he said. An environmental study was done, but soil samples weren’t taken as part of that. Ophoff indicated that no problems were identified. Regarding trees, Westphal wondered if the site would essentially be clear cut, aside from the northern native woodlands that will be preserved. Ophoff replied that only one of the larger trees will be saved on the rest of the site, next to the community building. The topography of the site requires significant earth work and regrading, he noted. Although it’s not required, Westphal said commissioners value any attempt to leave some of the vegetation in place as a buffer, to soften the appearance of a development. Ophoff pointed out that a hedgerow adjacent to the golf course will remain, as will trees on the south edge of the site. Westphal noted that the general area where this project is located is part of the city’s northeast area plan, which was developed during a lengthy planning process and is part of the city’s master plan. Zoning for that area had been part of that plan, he noted, but the Traverwood Apartments project is now requesting that a portion of the site be rezoned. He asked Kowalski for some insight as to why rezoning might be desirable, and what the alternatives might be if parcel weren’t rezoned. Kowalski reported that residential uses were also considered appropriate on that site, and that the northeast area plan’s recommendations for that site are almost identical to the project that’s being proposed. Providing public access to the site was seen as a crucial element, he noted, and that’s why the proposed paths on the site are important. Westphal asked Kowalski to comment on the intensity of use – comparing R4D to ORL zoning. Kowalski replied that he wasn’t a traffic engineer so he couldn’t speak to that issue, though he noted that the developer had completed a traffic study that was acceptable. Peak times would be different for residential use compared to office use, he noted, with residential traffic being more dispersed throughout the day. Outcome: Planning commissioners voted unanimously to postpone action on the Traverwood Apartments project. After the vote, Ophoff asked if there was a date for the project to be reconsidered. Planning manager Wendy Rampson said the next available meeting is Oct. 1. If all of the outstanding issues are resolved by then, the project would be on the Oct. 1 agenda. If not, the next meeting after that is Oct. 15. At their Sept. 17 meeting, planning commissioners considered a resolution to authorize two planning commissioners to attend the Michigan Association of Planning annual conference, held this year from Oct. 2-4 in Kalamazoo. Planning commissioners Paras Parekh and Sabra Briere, who also serves on city council, will be attending the October conference of the Michigan Association of Planners in Kalamazoo. The resolution also authorized the reimbursement of eligible expenses from the city’s planning services conference and training budget. 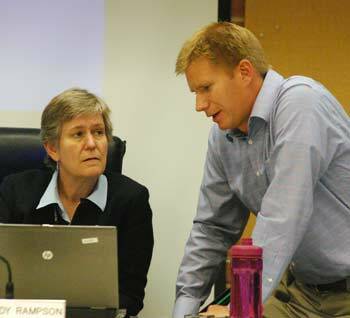 Planning manager Wendy Rampson noted that the commission’s bylaws require approval for the use of training funds. Commissioners Paras Parekh and Sabra Briere would be attending, although they won’t be attending the entire conference, she noted. Bonnie Bona reported that she had served as planning commission chair when the commission voted to make this authorization a part of its bylaws. It was done about five years ago, she said, when the city was struggling to overcome budget deficits. Rather than recommend that the training budget be removed, the commission thought it would be good to be more intentional about deciding whether to use those funds, she said. So they amended the bylaws to make authorization a requirement. Section 2. Members of the Commission shall serve without compensation. Commission members attending meetings for the benefit of the Planning Commission, the Planning and Development Services Unit, or for Ann Arbor planning in general shall be reimbursed for expenses incurred. Reimbursements shall receive prior approval by the Commission at a regular meeting. Parekh asked whether the resolution would still pass, if he and Briere did not vote. Rampson replied that the resolution required a simple majority vote. Outcome: The authorization passed unanimously on a 5-0 vote. Parekh and Briere did not cast votes. Eleanore Adenekan and Wendy Woods were absent. After the meeting, Rampson told The Chronicle that the training budget for planning staff and various planning-related commissions is $8,000. That budget covers the planning commission, historic district commission, and zoning board of appeals. MAP conference fees, lodging, transportation and other expenses are expected to be $500-$600 per person. Planning manager Wendy Rampson gave a brief update on the work of consultants who are developing recommendations as part of a downtown zoning review. The consultants – Erin Perdu and Megan Masson-Minock – plan to compile results from the most recent public survey as well as from a public forum held on Sept. 19. They’ll be preparing a report to present at the planning commission’s Oct. 8 working session, with commissioners considering the recommendations at their Oct. 15 regular meeting. 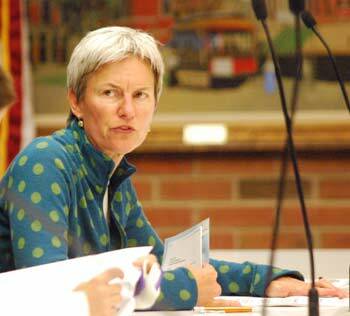 In her update from the city council, Sabra Briere reported on the work of the North Main Huron River Corridor task force, which has submitted its final report. The report includes a recommendation that the planning commission look at “river district” zoning. There is no such zoning currently in the city, but other communities have enacted this type of zoning along the riverfront, with attention to massing, height, and transparency of buildings for this gateway into the city. That’s something that might come before the planning commission in the future, she said. Section 8. Members are expected to attend regularly scheduled meetings and to notify the Chair and the Planning and Development Services Unit in advance if they expect to be tardy or absent. The Planning and Development Service Unit shall maintain attendance records and shall report to the Chair if an attendance problem appears to have developed. If a member misses more than three (3) regularly scheduled meetings in a row or four (4) or more meetings in a sixteen (16) month period, the Chair shall notify City Council. The Commission officers may discuss the matter with the member in question and if sufficient improvement in attendance does not occur within a reasonable time, the Chair may recommend to City Council that the member be removed. 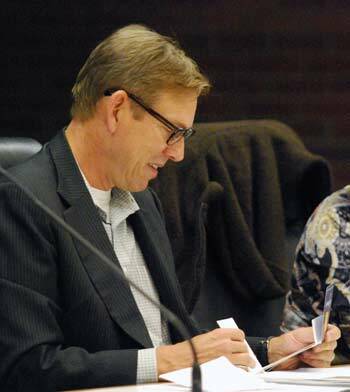 Responding to a query from The Chronicle after the Sept. 17 meeting, planning manager Wendy Rampson said that mayor John Hieftje has been notified of Adenekan’s extended absence, but there is no indication that he intends to replace her on the commission. Adenekan recently contacted Rampson, and indicated her intent to resume attending meetings soon. The commission’s next regular meeting is on Oct. 1. Present: Bonnie Bona, Sabra Briere, Ken Clein, Diane Giannola, Jeremy Peters, Kirk Westphal, Paras Parekh. Also: City planning manager Wendy Rampson. Absent: Eleanore Adenekan, Wendy Woods.